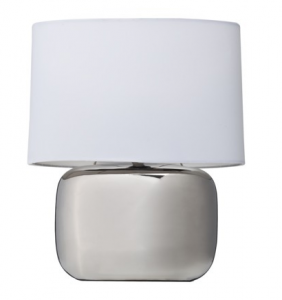 I love the understated elegance of this light, the Lens Table lamp from Best & LLoyd. The decoration on the base creates interest without being overbearing, and the colors are chic and elegant. I personally think this light would be perfect in a bedroom, either for a lucky guest or to enjoy every day in the Master. These first three lights are from Best & Lloyd, a UK firm which sells in the US through George Smith, a retailer to the trade. Unfortunate for those of us without a link into that special world, but if you are working with an interior designer or have your own retail license, lucky you. I’ll keep looking to see if they expand their distribution. 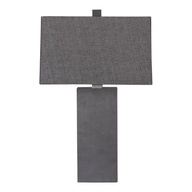 This second lamp from Best & Lloyd, the Cardin, would add some sparkle to your home, andis a wonderful table lamp. The scale they have chosen for the silver disks on the base is just terrific – it gives it some pizzazz but isn’t too busy and suits the scale of the lamp overall. Too many of these lights would be a lot, but one in a well placed spot would be terrific. 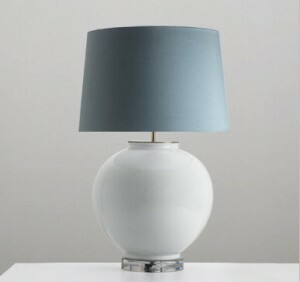 I love the color combination of this Jar Table Lamp from Best & Lloyd the soft blue with the white with a little grey, and the shape of the base in contrast to the shape of the shade. I think this would be wonderful for a living room where you’re trying for a style that is warm and inviting. It’s a timeless lamp, one that will always be in style. 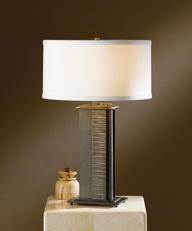 I love the interest the base of the Amalfi lamp from Currey & Co creates. 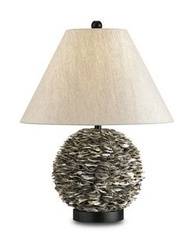 Made from oyster shells, it brings an organic, natural feel to the room in addition to its rounded shape. 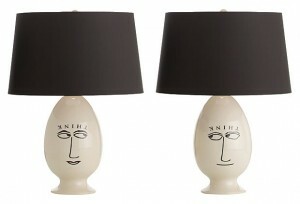 Designed in 1967, this light from Artemide (the Eclisse Bedside Table Lamp) is still current today in style and design. With a great feature for controlling the amount of light that shines out (great for anyone who is a late night reader and doesn’t want to disturb someone else), this light is a fun and stylish one for any bedroom or desk.